The Book of Leviticus is the third book of the Old Testament or, as known by the Hebrews, the Pentateuch. Research papers on the book of the Bible may examine the work as a religious text, a literary work or a historical document. Paper Masters has theology writers that will custom write a research paper on any book of the Bible for you, even Leviticus, one of the most antiquated and difficult books to understand. 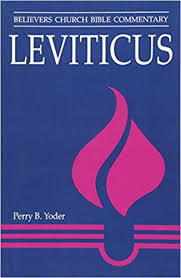 Leviticus is the third book of the Old Testament or, as known by the Hebrews, the Pentateuch. This book is known as “Va-yakra”, “and He called,” by the Hebrews, connecting it to the second book of the Bible, Exodus. It declares that the exact words of God are written down in it by Moses. God says, “I am the Lord your God” (Leviticus 26:13, NRSV), and “I am the Lord” (Leviticus 11:44) over and over for a total of about twenty-one times, a procedure that must convince the faithful that God is speaking to them. Biblical scholars view the Book of Leviticus as the map that will lead to the good things to come that God has promised for, if the people follow the rules that are laid out for them, they will be led to the Lord God. Leviticus tells about the relationship of God to His people and teaches His people how to maintain that relationship so that they can worship God for His love and justice and benefit from His love and good will. Following it helps form a community that can prosper and do good in God’s name. Amos Book of th Bible illustrates that Amos is one of the numerous books of the Bible that are dedicated to telling the stories of prophets of God. The Doctrine of the Bible research papers discuss doctrine of the Bible, also known as the doctrine of bibliology. Symbolism in the Bible - As one of the deepest and most profound pieces of literature, the Bible contains in its pages a number of critical symbols, taken from both the Old and New Testament. Biblical Archeology research papers examine the subset of archeology that seeks artifacts and information from ancient civilizations. Research papers on original sin look at the Biblical perspective of various religions and their idea of what original sin entails. Pharisees research papers discuss the Biblical people of the New Testament. Philistines Research Paper explores one of the most despised groups in history, and how their civilization began. Paper Masters writes custom research papers on The Book of Leviticus, which is the third book of the Old Testament.